Thunderstorms occur in association with a type of cloud known as a cumulonimbus. They are usually accompanied by strong winds, heavy rain, and sometimes snow, sleet, hail, or, in contrast, no precipitation at all. Thunderstorms may line up in a series or become a rain band, known as a squall line. Strong or severe thunderstorms include some of the most dangerous weather phenomena, including large hail, strong winds, and tornadoes. Some of the most persistent severe thunderstorms, known as supercells, rotate as do cyclones. While most thunderstorms move with the mean wind flow through the layer of the troposphere that they occupy, vertical wind shear sometimes causes a deviation in their course at a right angle to the wind shear direction. I've explained some of these terms in the glossary, so you can click on each item and learn more about Lightning! Water and ice move around inside the cloud; forced up by warm air currents, down by gravity, and compressed in the cloud. Just as rubbing a balloon can create static electricity, the particles in the cloud become charged. It’s not clear how it happens, but charges separate in the cloud. Positive charges move up, and negatives move down. Once a significant charge separation has built up, the positive and negative charges seek to reach each other an neutralise. ‘Streamers’ come up from the ground to form a pathway. Once a pathway is completed a spark forms, neutralizing the charge. As the negative charge races down, the air surrounding it heats up.The spark is very hot at almost 20,000 degrees Celsius, and it rapidly heats the air to create a shock wave. Is an electric current. Within a thundercloud way up in the sky, many small bits of ice (frozen raindrops) bump into each other as they move around in the air. All of those collisions create an electric charge. After a while, the whole cloud fills up with electrical charges. After you see a flash of lightning, count the number of seconds until you hear the thunder. (Use the stop watch or count "One-Mississippi, Two-Mississippi, Three-Mississippi," etc.) For every 5 seconds the storm is one mile away. Divide the number of seconds you count by 5 to get the number of miles. The loud thunder that follows the lightning bolt is commonly said to come from the bolt itself. However, the grumbles and growls we hear in thunderstorms actually come from the rapid expansion of the air surrounding the lightning bolt. A bow echo is shaped like an archer's bow. These systems can produce severe straight-line winds and occasionally tornadoes, causing major damage. A large slow-moving area of up draught and downdraught which causes violent thunderstorms, heavy hail, and tornadoes. Variation in wind velocity occurring along a direction at right angles to the wind's direction and tending to exert a turning force. 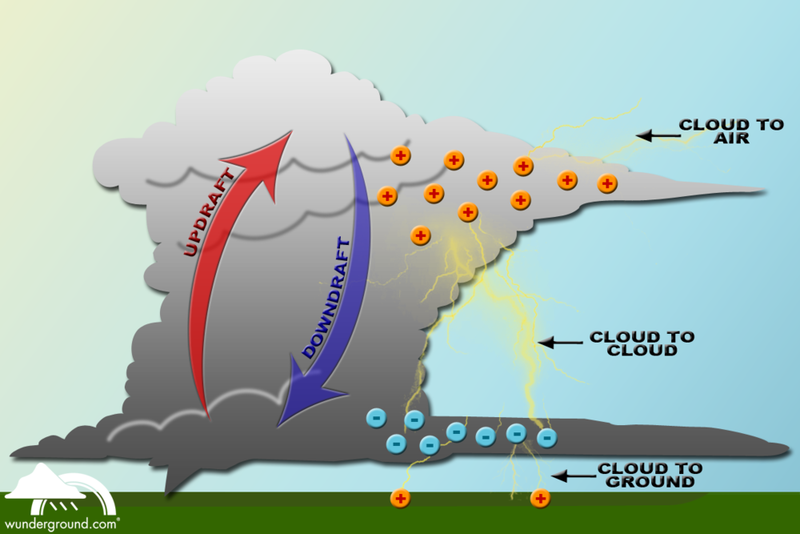 The upward moving air in a thunderstorm is known as the updraft, while downward moving air is the downdraft.